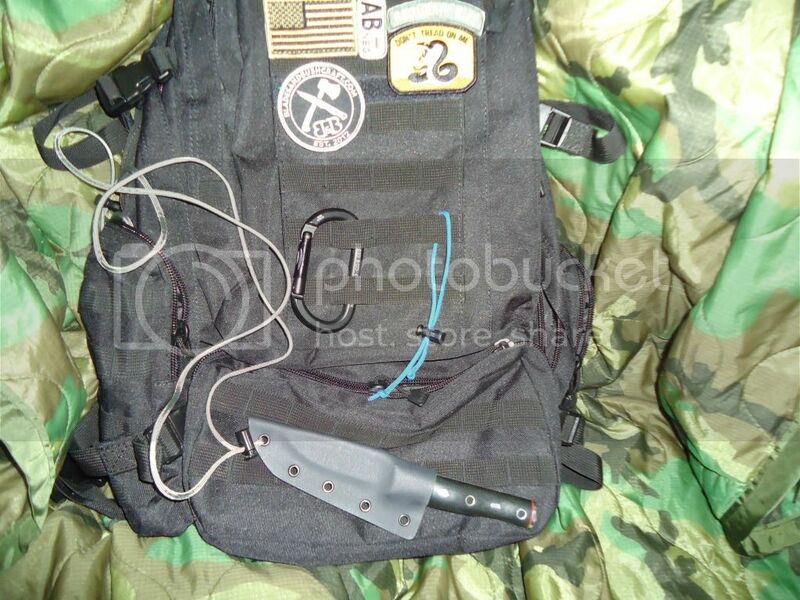 The other day UptheCreek sent me his Redneck Bushtool to make him a kydex sheath. He sent me a picture and told me that the biggest thing about the sheath was that he wanted to wear it upside down suspended from his neck. I told him no problem. I didn't remember to get build along photos. The sheath is tight fitting but not too tight. The knife will not fall out when UTC uses it like he plans. Here is it hanging suspended from a piece of paracord. (UTC you are getting the cord and the 2 cord locks. I know you said you have some but you are getting it anyway. You will, probably, need to cut some of the excess paracord away because I gave you more than enough to get the fit that you want). Sorry for the poor photos. As some of you may know, I lost my camera due to going overboard when I was at the Pot and Knife Challenge. I got the one that took the photos for this post from my sister and it is better than nothing but I think I will need to upgrade. Nice job Matt. Getting the fit right so that the knife can hang upside down is pretty ambitious. Looks perfect! I'll certainly put it through it's paces asap! UTC: I was going to email you but you posted faster than I could get the email out. I'm stoked, My friend CSugg has a setup like it and he really has high praise for it. Should be a nifty way to carry a pretty good sized knife...... and should be invisible worn under the arm. That's the plan anyways. Don't wait until it's too late to live your dream! Bear, the man reason I chose kydex is for weight, overall size and retention. This knife will snap into the sheath and should hold real tight. I intend to wear it under my arm and I know I run the risk of getting poked...but we do things ya know. Also, it can be strung up in any fashion. Tie it to a pack. Only my imagination will put limits on it's use. Aesthetically speaking it's not the greatest, but I bet it dont weigh and once. I have a nice leather rig for it. Just trying to expand its utility. I appreciate Matts efforts for me too. I agree leather looks a million times better! But IMHO in the field, kydex is perfect. As I experienced about a month ago in Florida, when kydex gets wet it, dries as quickly as dabbing it with a dry cloth or shaking the excess water off of it. Thus, my knife was away from unwanted moisture. If I had a leather sheath I could not do the same. 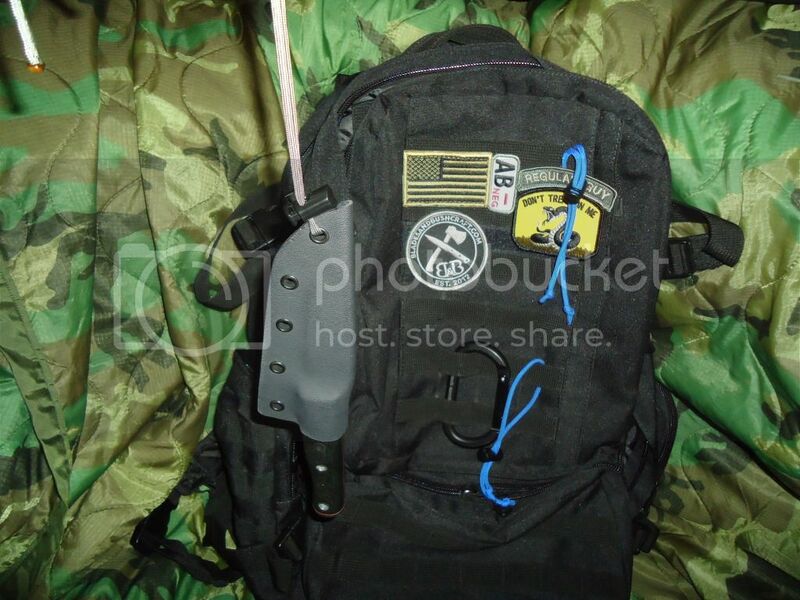 Also, if you get blood from skinning etc it can stain etc not kydex. Kydex IMHO is better in the field. Kydex, also, won't dry rot. Kydex if made to do so, will hold tight to you knife for great retention. Now a nice leather sheath on your belt beats any kydex in appearance in my opinion. But for usefullness, I have to say Kydex is the way to go. For field use, they can't be beat for functionality. But they are not as pretty as a gorgeous leather worked sheath. I've never used or seen any(other than in pictures), but from the looks of it, it looks almost like plastic.. I'll tell you what hermits realizes. If you go off into a far, far forest and get very quiet, you'll come to understand that you're connected with everything. It is in the same family as Poly Vinyl Chloride (PVC) or even better in the family of thermoplastics. It can be heated and molded easily. Kydex is a trademarked name of an acrylic/PVC alloy. plastic would be a fair description.... it's not about looks with kydex...but it works great! I've always been curious about the stuff, but have never purchased any. Do you heat in the oven, with a heat gun, boil it or what, to get it to the point where it is flexible enough to form around the knife? Do you wear gloves to hand-form it around the knife and how long does the 'window of opportunity' remain open to get it formed? Can you re-heat it to continue to work on forming it, or is it a one-shot deal? BTW, nice sheath guys.....pretty is as pretty does! You want all my trade secrets??? I use a heat gun. Yes, the plastic gets so hot that I wear gloves. I use the 'ove glove, actually one on each hand. Things get very hot, especially the heat coming out of the gun. Basically, I just move the material over the gun until it is supple. Then depending on the type of sheath that I am making, in this case the folded sheath, I fold it over the knife and then insert the knife and kydex in a kydex press. Assuming, I got it right, it is then on to cutting and shaping the design and sanding the edges and polishing them slightly, too. I drill the holes for the rivets and then insert the eyelet rivets and press them in, too. Yes you can reshape the kydex if you "mess up". The window of opportunity is quick enough where you can't diddle dally and but slow enough where you don't have to be excessively quick. Once in the press, it takes a minute or so to cool enough to hold its new shape. I sometimes have to reheat portions of a sheath to tight loosen the fit on a knife, at these times, I use my fingers and the 'ove glove. I am still not as skilled as the maker of the Azkwelke sheaths but one day I will be there....I hope. I didn't mean for you to give up all your secrets, Matt.....I was just curious how you did it It turns out that I kind'a knew it would be the way you describe it. I've done things similar with other plastics like anti-freeze jugs, PVC pipe, etc., too. Thanks a lot, for taking the time to enlighten me....I appreciate it! 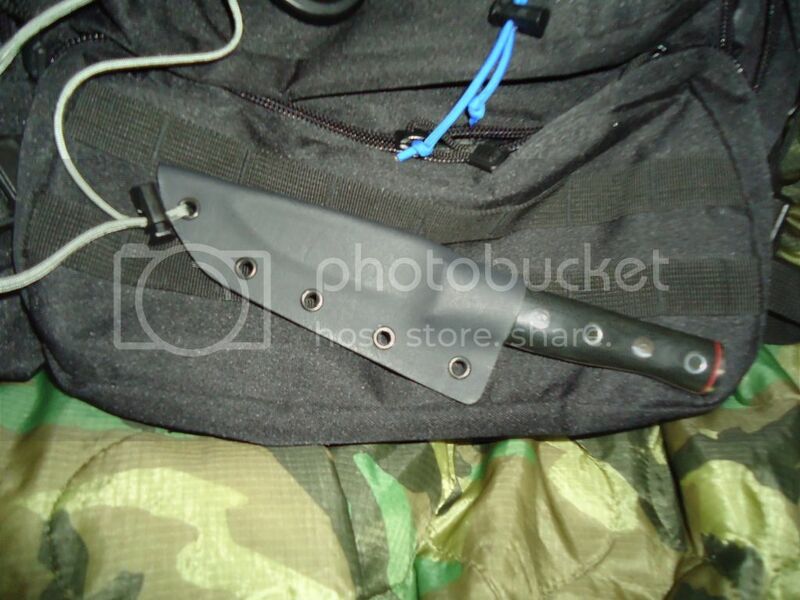 It's a press that has dense foam and sandwiches the kydex and knife to form the sheath it properly. They can be bought or made but IMHO they are really needed to get the sheath molded correctly. Nice work Matt! One thing is Creek is always canoeing. So for him it's the safest. Sorry I am late to the party in this thread. I know some folks prefer leather but I agree that for a true user knife kydex is the superior material for almost every sheath application. It doesn't absorb moisture so it helps keep the blade from rusting. That looks great Matt, really nice! Page created in 0.05 seconds with 29 queries.